An artist shares his work and creative process. 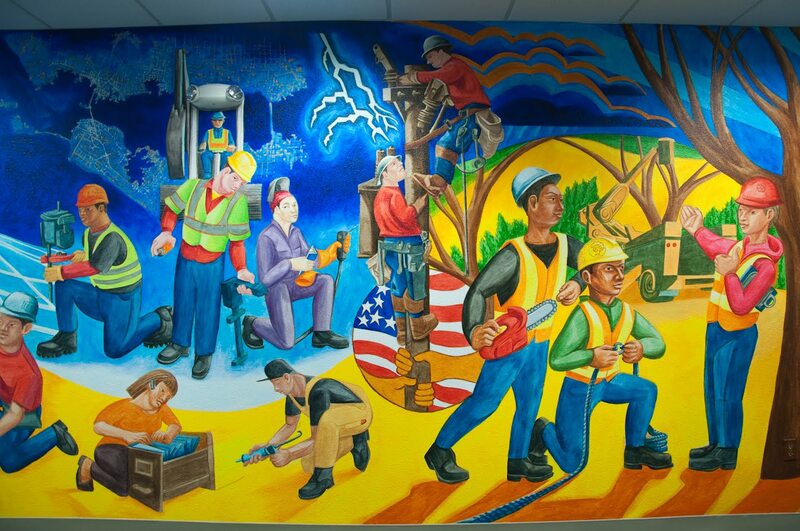 Unions became a focus this past year with a mural for the International Brotherhood of Electrical Workers 1245 and Adjunct organizing at the California College of the Arts. I was invited to paint the IBEW 1245 mural by Business Manger Tom Dalzall. Tom also is the author of Quirky Berkeley, and writes about murals too! The mural – Energy and Power – in the Vacaville union hall contributes to a lively visual environment that celebrates the history and activism of the local. The indoor mural, painted in March, compliments large historical photographs and object displays inside and outside the building. I also joined the movement of adjunct professors around the country fighting for more pay and security. We adjuncts at CCA voted to form a union with SEIU 1021. This is the second time I’ve become involved with SEIU. In 1990, Ray Patlán and I painted a mural on panels for SEIU through the unit at the Fine Arts Museums of San Francisco. A photo of that mural, titled "790" and painted in 1990, is on the Storytellingwalls.com "What Walls" page. Over the summer I supervised a group of six CCA students that painted a terrific mural Queen Califia Rules! about diversity at CCA and in the arts. Students of color and allies expressed a need for artistic education to include more social conscientiousness, more diverse art history, and more instructors that reflect the diversity of the country. The result is an impressive mural on the historic Martinez Studio building on the Oakland campus. It's been 13 years since a new mural was painted on the wall. The city of Berkeley honored me with a proclamation thanking me for the cultural work I’ve done over my career and declared May 12, 2015 “Eduardo Pineda Day!” It was an extra special honor because it was also my birthday! I am also helping out Edwin Lindo, born and raised in the Mission, run for Supervisor of District 9 in San Francisco by designing his campaign logo with Ray Patlán. Edwin is a great and much needed leader. Looking forward to a busy 2016! At the end of last year I began my second commission from Resources for Community Development. The project was two murals for the UA Homes building in Berkeley as part of the renovation of the facility. Thank you to RCD’s Jessica Sheldon for her inclusion of murals as a cultural element in the building! Thanks also to Cynthia Carrie, UA Homes Property Manager and her staff for their onsite support during the painting. RCD wanted murals that reflected the multicultural community of the building that includes single adults in affordable units and the Indian businesses on the first floor of the building. 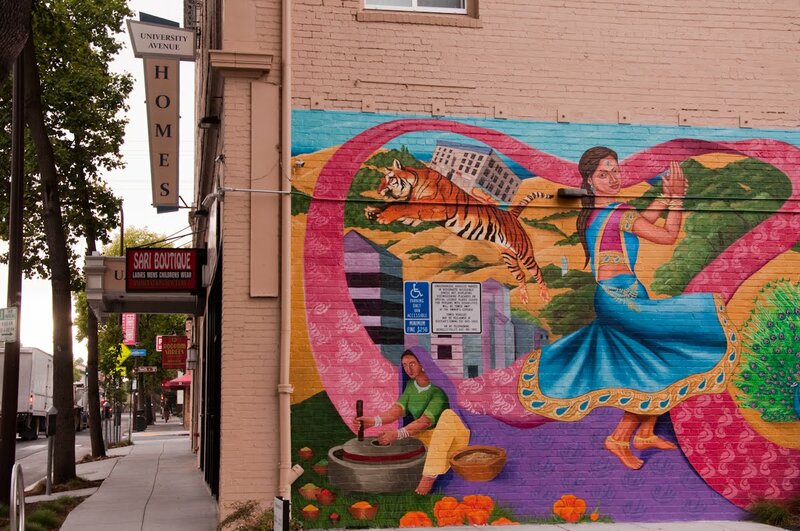 Maulin Chokshi, owner of Bombay Jewelry Company, one of the businesses and president of the University Avenue Association, envisioned a mural on the UA Homes building for many years. The renovation presented the opportunity to fulfill his vision. The murals became an instant hit with shoppers who regularly pose in front of the murals. Residents responded warmly, especially because the second mural, on 10th street, extended our presence and conversation about visual representation and community life. Joaquin Newman helped me with the initial design workshop with the residents in October 2013. Discussions with Chokshi and the other owners, Deepka of Bombay Spice House, and Parnish who represented Sari Boutique and Roopam Sarees provided insider sources of Indian culture. In January 2014, I recruited Nadya Voynovskaya and Rob Gibson to help me paint the walls. We met at Berkeley Community College while I taught the Mural Design&Creation class for Juana Alicia in Fall 2013. Nadya and Rob, veterans of Juana’s class, brought dynamic skills and strengths to the UA Homes project! We finished the UA Homes murals in early June. Rob documented our in-progress painting. I have a presence in the neighborhood with these two murals and the Berkeley Watershed and Community Mural at King Park! In October 2013, I curated The Tree of Life and Death: Días de los Muertos at the Oakland Museum of California, the 19th the Days of the Dead exhibition. I worked again with Evelyn Orantes, Curator of Public Practice, and Bea Carrillo-Hocher, and together with the artists we created the exhibition in the new Natural Sciences galleries! The Museum’s interdisciplinary context enriches the artists’ Ofrendas. Days of the Dead grew out of the celebration of agricultural practice and a worldview that places humans within the larger natural world – an entry into Natural Sciences. Days of the Dead is a living tradition inspiring changing forms of expression that promote invention and creativity and honoring the dead brings out the beauty and pageantry of the altars and practices – an entry into Art. Days of the Dead reminds us of individuals, their unique experiences, and their relationship in time to us – an entry into History. The artists that were: Ruben Guzman, Shayna Hirshfield, Miguel Chacon, Nancy Hom, Ernesto Olmos, Karen Seneferu, Samuel Rodriguez, Wendeanne`aka Stitt, Amy George-Cortez and Salvador “El Chamuco” Cortez, Fernando Hernandez (who curated the 15th annual exhibition), Natalia Anciso. The school and community groups were: Bancroft Middle School, lead by artist and teacher Lee Rosenberg; La Escuelita Elementary, lead by artist Jose Enrique Ortiz and teacher Margarita Garcia; community altar for Bobbi Salinas by ECHO (Educational Coalition for Hispanics in Oakland), lead by artist Patricia Rodirguez and writer Lucha Corpi. Codex to the Future was included in two exhibitions All Good Things at SOMARTS and Big Room For Ideas: Social in Practice at the Yerba Buena Center for the Arts. Shalini Agrawal and Chris Treggiari included the project in a selection of projects that are rooted in community arts. Shalini is the new Director of the Center for Art and Public Life and architectural designer with a strong community vision. Chris is Center for Art and Public Life scholar in residence at CCA. New projects are in the works! This year is about curating! I began working with Evelyn Orantes and the rest of the Oakland Museum of California staff to curate the Days of the Dead exhibition coming up October 9-December 8, 2013! It’s an honor to return after curating the show last year – Forgotten Stories, Remarkable Lives: Días de los Muertos 2012. The concept of that exhibition was inspired by the museum’s history collection. The upcoming exhibition will connect directly with the Natural Sciences collection and will be presented in the new Natural Sciences galleries. Mark you calendars now! I am also curating a one-woman show of Rosa M. Valdez’s work for the 2x2 Solo series at Proarts! Rosa managed our REACH Ashland Youth Center public art project for two years and in that time she modestly kept her professional artist side separate from her administrative role. It wasn’t until I reviewed portfolios for the 2x2 assignment and was captivated by her work, that I selected her and did a little sleuthing in order to confirm she was the same person I’d be working with at the Alameda County Arts Commission! Look for that show in September 2013, just before Days of the Dead. Being selected as one of the curators by the pioneering artist run space (I remember when Proarts was newly forming about 30 years ago) makes me feel connected to the local arts fabric. It follows a successful artist panel with Favianna Rodriguez and Camille Utterback organized by Pamela Ybañez and held at Proarts on February 14, 2013. I was the elder among the panelists as we talked about how to take good care of your self in an artistic career. Pamela saw a much needed discussion in the creative community and started to address it! Favianna and Camille are local giants! I finished my fourth semester of teaching mural painting at the California College of the Arts. The mural class grew out of Ethnic Studies that was established in the late 1970s when Malaquis Montoya taught at the art school. Several other artists taught mural making after Montoya left in about 1990. I took over the mural class from Ray Patlán who began teaching the class in about 2004. Ethnic Studies has become Diversity Studies and the murals are produced in different neighborhoods in Oakland. Ray continues to teach mural classes at Laney College (since 2000) and Juana Alicia Araiza at Berkeley Community College (since 2008). For the second year, Joaquin Newman and me collaborated with Mariana Ferreira to create another mural as part of her anthropology class at San Francisco State University. In February we finished a mural for HealthRIGHT 360 in San Francisco. The mural is inside at a closed facility. It was an emotional project about the journey towards recovery after addiction. Last year’s project for the Mission Neighborhood Health Center was published in a research paper by Alison Sprague in the International Journal of Arts & Sciences. Wow! Last January we completed the public art project at the REACH Ashland Youth Center! This two-year project is my first work in cast concrete and laser engraved pavers. It is another terrific commission from the Alameda County Arts Commission. The commission has supported our community work and provided great opportunities for my creative growth. In December 2012, we installed murals for a lovely new restaurant, Palmer’s Tavern in San Francisco that will open soon. This was an interesting mash-up of Fillmore District historic images and 1940s style painting. The murals decorate dining booths along one side of the restaurant. In another mash-up, Joaquin took his signature Days of the Dead Mexican movie posters and tailored them for Masa café on the Google campus, adding some flavor to that idyllic work setting! The two large paintings are made to travel so they can be used to transform Google events. This, along with the Tina Tamale Transporter (did I mention the painted truck?) and the Zinzanni characters form a rollicking vision that extends our creativity into the business community. The Tamale Transporter is a culinary movie (yet to be made) promoted on a painted truck for Tina Tamale while she cruises to out-of-restaurant locations to deliver her popular menu. Stay Creative! Stay Engaged! The collaboration continues. Joaquin Newman and I received a second commission from the Alameda County Arts Commission. We will decorate the Ashland Youth Center, working with youth and families from the Ashland neighborhood. Watch for this inspirational facility! We put the final touches on the Berkeley Watershed and Community Mural sponsored by Friends of King Park. Thanks to Jeanine Strickland and Lessly Fields for their dedication to the neighborhood and Kala Art Institute for helping with the education piece! Last March we installed the Right to Good Health mural at the Mission Neighborhood Health Center in San Francisco and the 100 Families Highland Hospital Community Mural Project, both mentioned in an earlier post. In addition, we produced characatures for Teatro ZinZanni’s spring production, Too Hot/Caliente to Handle! The San Francisco dinner theater, wanted the feel of movie posters from the Golden Age of Mexican Cinema. Who better for the job than Joaquin? We combined headshots, costume sketches, and photos to flesh-out the zany characters in the show directed by “Slick Ric” Salinas of Culture Clash! What an honor! We also painted another diaspora map for the Museum of the African Diaspora in the Education Center. It’s a popular tool that helps visitors better understand the slave trade history that underlies our national history and relevant to understanding contemporary human trafficking. Our exhibition Community Spirits, January 30-February 26, 2011, at the Alameda Free Library, was written up in the Alameda Journal. The display included documentation of recent mural projects, Joaquin’s paintings and my photographs. I contributed a photo in the Alameda on Camera exhibition, April 1-May 28, 2011 at the Frank Bette Center for the Arts. My assignment on Alameda island was “Area 10,” bounded by the San Leandro Bay at Towata Park, High Street, Encinal Avenue, and Fernside Boulevard. I was attracted to the bird life particularly at the Towata Park beach. I took nature shots and found a pigeon racer among the houses nearby. Finally, the International Longshoremen’s and Warehousemen’s Union sculpture mural in San Francisco, appeared in a New York Times article about the challenge of maintaining the San Francisco public art collection. This significant project was done by me, Miranda Bergman, Timothy Drescher, Nicole Emmanuel, Lari Kilolani, James Morgan, Raymond Patlán, James Prigoff, O’Brian Thiele, and Horace Washington in 1986. Sponsored by the ILWU, it is part of the San Francisco Arts Commission collection. Health, the environment, and imagination continue to surface as important concerns among the people we work with and the communities we are creating for. They’re just plain important! Stay Creative! Stay Engaged! Joaquin Newman and I started painting The Right to Good Health mural for the Mission Neighborhood Health Center (MNHC) in San Francisco. Students in anthropology professor Mariana Ferreira’s class at San Francisco State University surveyed patients, staff and administrators at the Center as part of the anthropology methodologies class. Their findings helped us create the design. The Right to Good Health mural is funded by the Center for Minority Health and Health Disparities of the National Institutes of Health (Grant 1R13MD005792-01). In addition, the students initiated the San Francisco Mural Project that places photos, descriptions, and video clips on a mural map using Google Earth. The map is on the Right to Know, an interactive web project dedicated to human rights and co-founded by Mariana. We are painting the mural on canvas at Joaquin’s Forrealism Studio in Alameda. MNHC has embraced our project – thank you Director Brenda Storey, Deputy Director Fernando Gomez-Benitez and the staff! We will install the mural at the Center in January 2011! Our mural will join two murals from the initial wave of San Francisco community murals. In 1977, Michael Rios and Garciela Carrillo painted the murals on the Shotwell Street entrance to the Center. People will see The Right to Good Health mural as they go through the doors between the Rios and Carrillo murals. Finally, I will exhibit Heartthrob, a photo developed in a commissioning program of the Alameda County Arts Commission (2009) in the 26th Annual January Juried Show at Gallery Route One from January 21-February 20, 2011. I was given a merit award! Come to the reception on Saturday, January 23, 3-5 pm. I co-curated Images: Independence and Revolution an exhibition for The Mexican Museum in San Francisco that opened last month. The museum is starting up again with its third exhibition since October 2009. Check out the show! 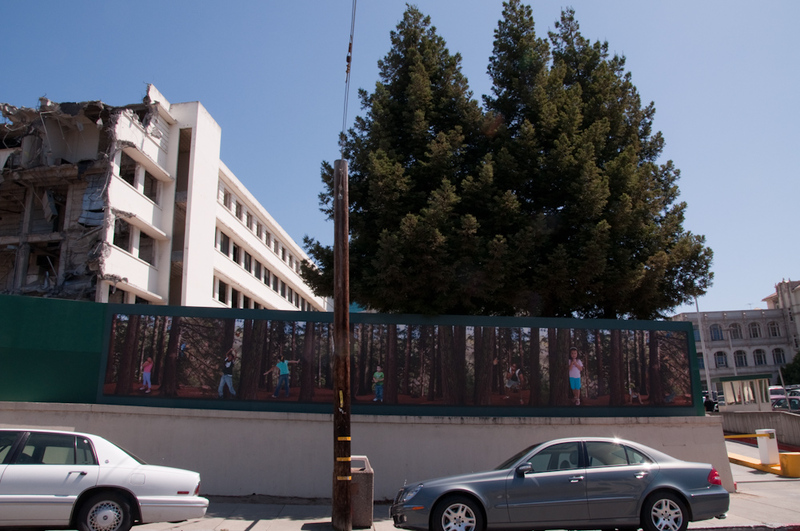 Joaquin Newman and I received a commission from the Alameda County Arts Commission to decorate a temporary construction fence surrounding Highland Hospital in Oakland, CA. We will generate images for the mural in a series of hands-on workshops with families to launch 100 Families Alameda County: Art and Social Change, now an official arts education program of the Arts Commission. After designing the mural on laptops, the mural will be printed on plastic panels and installed on the plywood fence that encloses the hospital renovation project. It’s great to work with the Commission again! 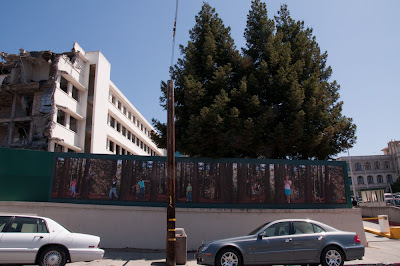 We are also developing a mural on the Right to Good Health with Mariana Ferreira and her anthropology students at SFSU. This project is part of the annual Human Rights Summit and funded through the National Institute of Health. We hope to secure the site in the coming month and complete the mural by the end of the year! We received recognition from Supervisor John Gioia for Earth Speaks, the mural at the El Sobrante Public Library. Thanks to the SPAWNERS and Earth Team Environmental Network! The Fox Courts mural is highlighted in Artful Teaching, a new book for teachers! It’s exciting to be recognized in print and an honor to be cited in a book for educators! Also receiving recognition is the mural Ray Patlán and I painted for Gundlach-Bunschu Winery in Sonoma, CA in 1990. Checkout the photo in the San Francisco Chronicle! The Bunschu family was great to work with and they have a beautiful winery with fantastic wine! And what a mural! This year began with painting a third mural for the Museum of the African Diaspora. Collaborating with Joaquin Newman, we painted a map of the African diaspora for the current exhibition African Continuum: Sacred Ceremonies and Rituals , composed of photographs by Bryan Wiley accompanied by altars created by Dowoti Désir. Media artist Miguel Osorio designed the map and a companion book about the photo project. The MoAD project reconnected Joaquin and Miguel, who knew each other earlier in their careers. MoAD connects people in this personal way but also through shared cultural histories. Thanks to writer and educator Miriam de Uriarte, I visited the Alhóndiga de Granaditas in Guanajuato to view the mural by José Chávez Morado dedicated to the abolition of slavery in Mexico’s independence from Spain in 1810. The mural relates to MoAD’s Slave Narratives exhibition. At the end of 2009, I painted my second mural for MoAD, a re-interpretation of Romare Bearden’s The Street (Composition for Richard Wright). Between the MoAD projects Joaquin and I painted and installed a mural for the Family Resource and Education Center in Oakland. This model program serves the East Oakland community. Last year the Bekris Gallery opened at 49 Geary. Dedicated to showcasing contemporary African artists, it’s a unique and impressive gallery in San Francisco. The Bay Area is fortunate to have a venue for rarely seen contemporary work from Africa. Check it out! My enthusiasm for the gallery prompted a collaboration with gallery owner Cynthia Plevin and muralist Raymond Patlán to introduce South African artist Bruce Clarke to visual art students at the California College of Art in December 2009. I contributed to Alameda on Camera exhibition on view at the Frank Bette Art Center until May 1, 2010. My contribution this year was spontaneous historical re-photographing of streets and houses on the island. With a temporary loan from the Bay Area Electric Railroad Association archives, my photographs of Encinal Avenue can be compared to Encinal Avenue approximately 100 years earlier during the first days of electric train service and 70 years ago in the final days as that same rail service was shut down. Finally I also participated in the Photo Alliance portfolio review, March 12-14, 2010. I received much-needed strokes for my efforts and insightful challenges from the professional photography community. I highly recommend the annual review to those that want collegial wake-ups and affirmation of good work. At the end of April, I will lead a mural by the Aqua Team, a program of Earth Team Environmental Network. These young environmentalists at Richmond High School learn about environmental stewardship and use visual art to encourage us to take responsibility for the shared environment. The Spawners, along with Earth Team and the Contra Costa County Library sponsor the mural. Take a moment to view the mural at the El Sobrante Public Library. Then view the San Pablo creek currently under restoration at this site. It is energizing to work with a new generation of ambitious youth in Contra Costa County! Stay Creative! Stay Engaged!